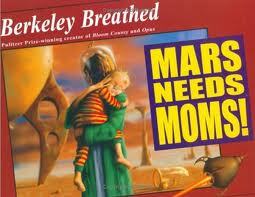 The movie trailer is out – Berkeley Breathed’s Mars Needs Moms! is now a movie. I felt a little bit of pressure to get this book read before my students had no idea that the movie was based on a book. Because it really is such a great book! Almost always, in my opinion, books trump the movies even without the special effects! There is an intimacy that happens when we share a book that a movie just can’t touch. And you are allowed to interrupt with comments and questions and nobody says SHHHH! At least not in our class! “A boy needs a Mom to go to space with him! ?” “No, it is the Martians that need Moms to take care of them.” “Yeah because Moms are superheroes!” “No – they are Supergirls!” Absolutely! Really what happens is that Martians have been keeping an eye on Earth and have realized that since they have grown up motherless, they will need to send Martian Raiders (with a big net) to capture some Moms. Milo, who has been doing some pretty serious Mom bashing (using terms like bellowing broccoli bully and carrot-cuddling cuckoo to describe his loving mother) watches his Mom be grabbed and rushed into a waiting spaceship. (“Do aliens eat Moms?” Scott wondered.) Milo follows, stowing away on the ship. Exiting the spaceship on Mars, he trips and falls and his helmet smashes to bits. Breathing Martian air – Milo is doomed! Until . 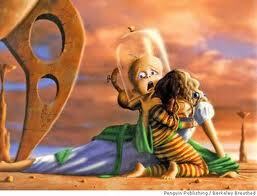 . . a figure appears and gives up her helmet so Milo can survive. Read the book before you see the movie! It’s worth it! This entry was posted in Picture Book Love and tagged Berkeley Breathed, fantasy, favourite illustrators, fiction, great read alouds, picture books by carriegelson. Bookmark the permalink.